Why the Panda? For the symbol and the colors, black and white, of anarchism, but essentially “because it was the nicest of the cheap mascots on sale on E-Bay China.” We digress to recall that China has had “the diplomacy of the panda” since 2000BC. There they offer giant pandas as a sign of good relations. Er Chun and Li Ji attest to this, two emissaries of friendship loaned to Stephen Harper in February for ten years. 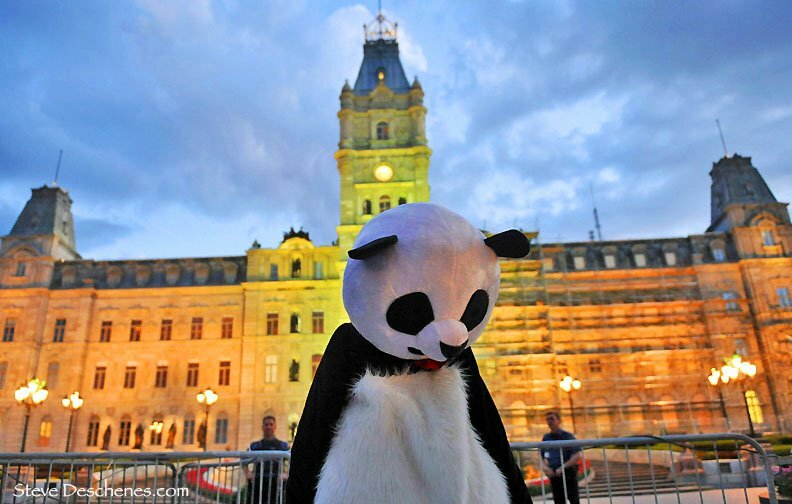 AnarchoPanda, here and now, offers himself to dissolve the tension between students and police. His solution? A kiss attack the Tao Tao way. “The day before yesterday, I had got police officer; yesterday, three. I feel like they have an exact code of conduct – do not answer questions, do not look make eye contact – but the line of the code that says what to do when you are hugged by a mascot seems nonexistent,” says the AnarchoStuffie, giving a half smile. Québec’s police officers seemed less receptive to his disarming gestures than those of Montreal. Afraid of the bear, perhaps? In the street he saw everything. “In the current context, you never now if violence will start, from which side, or how far it will go.” He is outraged by the abuse at the hands of the police. “I have often seen police officers hitting students who are dispersing, running far from the action. You can’t ask 1000 people to disperse in five second. It’s irrational: you ask people to do something, they do it and you hit them.” It’s just as incongruent to tolerate a protest several tens of minutes after the police warn they will charge without informing them again. This passion in their voice, this whole undertaking are those of the great political discourses. Panda for president? A half smile pierces the smoke from his cigarette. “That would be contradictory for an anarchist panda. I don’t lead, I don’t control, I’m not a spokesperson, I’m not a freaking mascot. AnarchoPanda, it’s my act of consciousness. In my opinion, the students’ cause is just, what they endure, as the government and police’s response, is illegitimate. My act may be absurd or useless, but I am there with them. As long as the students will make themselves a part of this, Anarcho will be there.” He will be back out tonight, inviting the crowd to meet him at place Émilie-Gamelin to beat the Guinness world record for most police arrests. “In an original act of collective solidarity, help the SPVM pulverize their record in a phenomenal way so that they can move on to something else as quickly as possible”, says the Facebook page for the event. AnarchoPanda, it’s practical philosophy. On the sidewalk. In real time. From Le Devoir and translated from the original French by Translating the printemps érable. In my opinion, the students’ cause is just, what they endure, as the government and police’s response, is illegitimate. My act may be absurd or useless, but I am there with them. As long as the students will make themselves a part of this, Anarcho will be there. Just a comment to say that Anarchopanda officially went into hibernation on 12th September. I know, sleep well, I got a couple of tweets from Anarchopanda, but never a hug.